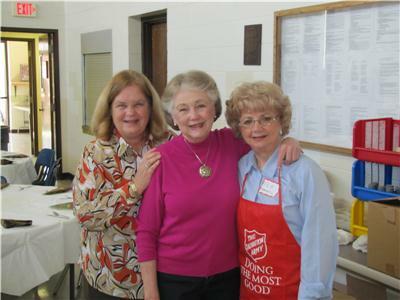 Marcia Kling, well-known Chattanooga TV personality, will be awarded a plaque welcoming her as a Lifetime Member of the Chattanooga Salvation Army Advisory Board on Monday. The recognition will take place at noon at The Salvation Army at 1019 North Moore Road across from Brainerd High School. This high honor is only offered to those who have served over 15 years and have displayed outstanding leadership. “Miss Marcia” began her exceptional tenure of service as an active board member in 1976. Ms. Kling is most beloved for 36-years of serving as The Salvation Army’s Annual Thanksgiving Meal Home-Delivery coordinator. Working alongside her husband, David, they have ensured the preparation, packaging and delivery of hundreds of traditional Thanksgiving Dinners to the needy in our community. The Chattanooga Salvation Army Advisory Board is a group of business leaders and other outstanding citizens who share their vision and leadership in supporting The Salvation Army promise to our community of Doing the Most Good for People in Need. For more information, or if you would like to support the ministries of The Salvation Army, visit the website at www.csarmy.org. Donations may also be mailed or dropped by The Salvation Army, 822 McCallie Ave., Chattanooga, Tn. 37403. For information, please contact Marketing Director Kimberly George at 423 503-1801 or kimberly_george@uss.salvationarmy.org.